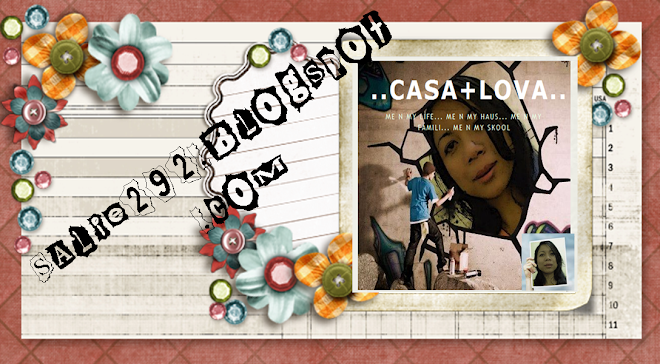 ..Casa+Lova..: Gallstone n Kidney stone(renal stone)..What is the different? Gallstone n Kidney stone(renal stone)..What is the different? Hola...2day i would like 2 share about 3 different types of disease...Gallstone,Kidney stone(renal stone) n hydronephrosis...Ni pun i collect semua atikel from different source.cari dlm bahasa melayu,tp sayang..elek.Why?bcaus last time my hubby didiagnosed with 3 penyakit tu la.mula2 tu katanya kidney stone...lepas 2 wujud la pulak hydronephrosis n last but not least..gallstone.dia py simptom...hampir sama je.cuma lokasinye yang x serupa...baca la ye..
Gallstone disease is a common medical problem, affecting well over 25 million people. Nearly 1 million new cases of gallstone disease are diagnosed every year . Approximately one-quarter of these require treatment, with a cost to society of several billion dollars annually. In recent years, important advances have been made in the understanding of gallstone disease and in the development of new treatments. The gallbladder is a sac, about the size and shape of a pear, which lies on the undersurface of the liver in the upper right-hand portion of the abdominal cavity. It is connected to the liver and the intestine by a series of small tubes, or ducts. The primary job of the gallbladder is to store bile, which is produced and secreted continuously by the liver, until the bile is needed to aid in digestion. 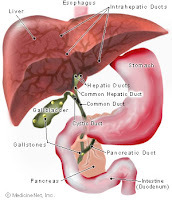 After a meal, the gallbladder contracts and bile flows into the intestine. When digestion of the meal is over, the gallbladder relaxes and once again begins to store bile. Bile is a brown liquid which contains bile salts, cholesterol, bilirubin and lecithin. About 3 cups of bile are produced by the liver every day. Some substances in bile, including bile salts and lecithin, act like detergents to break up fat so that it can be easily digested. Others, like bilirubin, are waste products. Bilirubin is a dark brown substance which gives a brown color to bile and stool. Gallstones are stones that form in the gall (bile). Bile is a watery liquid made by the cells of the liver that is important for digesting food in the intestine, particularly fat. Liver cells secrete the bile they make into small canals within the liver. The bile flows through the canals and into larger collecting ducts within the liver (the intrahepatic bile ducts). The bile then flows within the intrahepatic bile ducts out of the liver and into the extrahepatic bile ducts-first into the hepatic bile ducts, then into the common hepatic duct, and finally into the common bile duct. From the common bile duct, there are two different directions that bile can flow. The first direction is on down the common bile duct and into the intestine where the bile mixes with food and promotes digestion of food. The second direction is into the cystic duct, and from there into the gallbladder (often misspelled as gall bladder). Once in the gallbladder, bile is concentrated by the removal (absorption) of water. During a meal, the muscle that makes up the wall of the gallbladder contracts and squeezes the concentrated bile in the gallbladder back through the cystic duct into the common duct and then into the intestine. (Concentrated bile is much more effective for digestion than the un-concentrated bile that goes from the liver straight into the intestine.) The timing of gallbladder contraction-during a meal-allows the concentrated bile from the gallbladder to mix with food. Gallstones usually form in the gallbladder; however, they also may form anywhere there is bile; in the intrahepatic, hepatic, common bile, and cystic ducts. Gallstones also may move about within bile, for example, from the gallbladder into the cystic or common duct. Gallstones are pieces of hard solid matter in the gallbladder. They form when the components of bile — including cholesterol and bilirubin — precipitate out of solution and form crystals, much as sugar may collect in the bottom of a syrup jar. Almost 80 percent of patients with gallstones have cholesterol stones. Gallstones may be as small as a grain of sand or as large as a golf ball, and the gallbladder may contain anywhere from one stone to hundreds. Sometimes the gallbladder contains only crystals and stones too small to see with the naked eye. This condition is called biliary sludge. · Patients with severe liver disease. · Patients with some blood disorders such as sickle cell anemia and leukemia. · Women over 20 years of age, especially pregnant women, and men over 60 years of age. · Overweight men and women. · People on “crash diets” who lose a lot of weight quickly. · Patients who use certain medications including birth control pills and cholesterol lowering agents. Many people with gallstones have no symptoms. Often the gallstones are found when a test is performed to evaluate some other problem. So-called “silent gallstones” are likely to remain silent, and no treatment is recommended. The most typical symptom of gallstone disease is severe steady pain in the upper abdomen or right side. The pain may last for as little as 15 minutes or as long as several hours. The pain may also be felt between the shoulder blades or in the right shoulder. Sometimes patients also have vomiting or sweating. Attacks of gallstone pain may be separated by weeks, months or even years. It is thought that gallstone pain results from blockage of the gallbladder duct (cystic duct) by a stone. When the blockage is prolonged (greater than several hours), the gallbladder may become inflamed. This condition, called acute cholecystitis, may lead to fever, prolonged pain and eventually infection of the gallbladder. Hospitalization is usually necessary for observation, for treatment with antibiotics and pain medications, and frequently for surgery. More serious complications may occur when a gallstone passes out of the gallbladder duct and into the main bile duct. If the stone lodges in the main bile duct, it can lead to a serious bile duct infection. If it passes down the bile duct, it can cause an inflammation of the pancreas, which has a common drainage channel with the bile duct. Either of these situations can be extremely dangerous. Stones in the bile duct usually cause pain, fever and jaundice (yellow discoloration of the eyes and skin) sometimes accompanied by itching. You get pain in your abdomen when a gallstone gets stuck in one of the tubes that carry bile. This pain is steady and bad. You usually feel it in the upper right side of your abdomen. It feels like cramping. Doctors call it biliary pain or biliary colic. You often get this pain in the evening or at night. And it typically comes on fast, often after you eat. It may stop after only fifteen minutes. But it typically goes away after four hours to six hours. Sometimes it lasts up to 24 hours. With time, the gallstone may pass. It just goes into your bowel and out in your stool. In that case, your pain goes away. Your first attack of biliary pain may scare you a lot because it hurts so much. You may think you're having a heart attack. You may have to stop what you are doing. Usually, painkillers such as acetaminophen (Tylenol) and ibuprofen don't work for this kind of pain. Moving around or passing gas doesn't help either. During an attack of biliary pain, you may also feel sick to your stomach and throw up. You may be sweaty and feel restless. And your abdomen may still feel sore even after the attack has passed. · Get gas or indigestion after eating fatty food. Irritable bowel syndrome is a common condition that causes symptoms such as stomach pain, bloating, diarrhea and constipation. It can be cause long-term discomfort but it doesn't usually lead to serious health problems. Your doctor will check for these, too. The most important parts of any diagnostic process are the patient’s description of symptoms and the doctor’s physical examination. When gallstones are suspected, routine liver blood tests are helpful since bile flow may be blocked and bile may back up into the liver. o Abdominal ultrasound: Most commonly used to determine the presence of gallstones. A special instrument is used to bounce sound waves against hard objects like stones. Ultrasound is approximately 95 percent effective in diagnosing gallstones; however, it is not very accurate in determining if a stone has passed out of the gallbladder into the bile duct. o Cholescintigraphy, or HIDA scan: A radioactive tracer is injected into a vein, taken up by the liver and excreted, or eliminated, into the bile. This exam can help determine how well the gallbladder contracts in addition to giving information about whether stones are present within the cystic or common bile ducts. o CT scans: May detect gallstones; however, are less accurate than abdominal ultrasound. o Magnetic resonance imaging (MRI) scans. o Endoscopic ultrasound or EUS (which utilizes a small ultrasound probe at the tip of an endoscope passed into the stomach). o Endoscopic retrograde cholangiopancreatography or ERCP (X-ray dye injected into the bile duct through an endoscope passed through the mouth). These tests may carry small risks. It is important to talk to your gastroenterologist about which test is most appropriate for you. When gallstones are not causing symptoms, treatment is usually unnecessary. Surgical removal of the gallbladder (cholecystectomy) is the most widely used therapy when symptoms have arisen from gallstones. Patients generally do well after surgery and have no difficulty with digesting food, even though the gallbladder’s function is to aid digestion. In laparoscopic cholecystectomy, the surgeon makes several incisions in the abdomen through which a tiny video camera and surgical instruments are passed. The video picture is viewed in the operating room on a TV screen, and the gallbladder can be removed by manipulating the surgical instruments. Because the abdominal muscles are not cut, there is less postoperative pain, quicker healing and better cosmetic results. The patient usually can go home from the hospital within a day and resume normal activities within a few days. Laparoscopic cholecystectomy has become common and is now used for more than 90 percent of all gallbladder removals. However, it cannot be used in all cases. For instance, it may be difficult or dangerous to remove a severely inflamed gallbladder laparoscopically. It may also be more difficult to remove a stone from the bile duct laparoscopically, if one is found at surgery to have passed out of the gallbladder and into the duct. However, stones in the bile duct can frequently be removed with ERCP. Stay close to a healthy weight. Research shows that intentional weight loss (dieting, not weight loss from illness) followed by unintentional weight gain may increase your risk for forming gallstones, especially if you are a woman.If you need to lose weight, do so slowly and sensibly. When dieting, aim for a weight loss of only 1lb to 1.5lb per week. it is also important to avoid rapid weight loss and starvation diets. If you are on a rapid weight-loss diet, it is recommended that you be under a health professional's care. You may want to ask your health professional about taking medicines to help reduce your chances of developing gallstones while you are on such a diet. Research shows that eating regular meals that contain some fat (which causes the gallbladder to empty) can help prevent gallstones. Eat plenty of whole grains and fiber, and have regular servings of food that contain calcium (found in green, leafy vegetables and milk products). Limit saturated (animal) fat and foods high in cholesterol. Increased levels of physical exercise also may be an important way to reduce your risk of forming gallstones. One study has shown that women who exercised regularly decreased their risk of having to have the gallbladder removed. Exercising 2 to 3 hours per week reduced the women's risk by 20%. In a large study of men, 2 to 3 hours of moderate running per week reduced by 20% the risk of forming gallstones that cause symptoms. Along with eating a low-fat diet, exercise is also an effective way to help you stay close to a healthy weight and lower your cholesterol and triglyceride levels. Some evidence shows that taking hormones such as estrogen after menopause or taking high-dose birth control pills may increase a woman's risk of forming gallstones that cause symptoms.If you are taking such hormones, talk with your health professional.